In celebration of the American Library Association’s National Library Week running from April 7 – 13, I thought I would break out this book tag I’ve been hanging on to. I don’t recall where I found it, but I’ve been very eager to get it posted. Many thanks to the original creator. 1. How often do you visit your local library? Physically not very often, but I frequently browse the online catalogue to make sure I have plenty of ebooks ready to go at a moment’s notice! When my son was younger I would go to a weekly storytime session with him every Saturday, but he kind of lost interest in that (he still loves being read to though!). 2. Are you the type of person who checks out more books than you can read or are you someone who checks out the exact amount of books you intend to read before they are due? I’m usually pretty good about only having the book I am currently reading checked out at any one time. Where I run into trouble, however, is when things I’ve had on hold long-term come through either while I’m already in the middle of a book or at the same time. At that point the race is on to finish them before they auto-return! Probably 5 or 6. I was fortunate in that I grew up in a town with a great public library that my parents took full advantage of. Some ten years later, I would also have my first job working at that library! 4. Do you go to your library for a particular book or do you check out anything that piques your interest? It depends on my mood, but more often than not I am looking for a specific title or author. 5. Do you only check out books or do you also get DVDs, audiobooks, etc.? Probably 98% of my library check-outs from the past year have been ebooks. It’s just so convenient being able to download them directly to my phone and/or Kindle. 6. From what section of the library do you check out most of your books? Science Fiction/Fantasy followed by General Fiction. The easy answer is free books, but I also like the idea of supporting a community resource that is centered around the idea of making reading and research generally available to all who seek it out. It’s such an important service that everyone who can really ought to take advantage of. Discounted museum passes are also a pretty nice perk, too. Hello and welcome to my Second Annual BeerRantsAndBooks Blogger’s Choice Book Awards! In preparing for this post I’ve gone through my notes on all the books I reviewed this past year and compiled a list of my favorite characters and stories. I’m quite pleased with how strong all the nominees were this year, though that did mean making my final decisions was no easy task! To note, I considered for these awards any book I read in 2018, regardless of when it was initially published. As much as I’d like to, I simply don’t have the time to focus solely upon new releases. With that said, bring on the nominees! Dalinar Kholin (Oathbringer, by Brandon Sanderson – Book Three in the Stormlight Archive): Oathbringer was Dalinar’s turn to take center stage in the Stormlight Archive and he certainly made good use of his time. In this book he emerged not only as a leader capable of uniting humanity, but also someone who may have the potential to stand up to Cosmere bad guy Odium as well. Hadi (Frankenstein in Baghdad, by Ahmed Saadawi): Hadi stands out on this list in that unlike the other characters here, he is not a fantasy hero. Instead, he’s a junk trader with a drinking problem who has spent months morning the loss of a friend who died in a suicide bombing. To find purpose in his grief, he begins the grim task of collecting body parts and sewing them together in the hopes that a completed corpse can get a dignified burial in honor of his friend. Kvothe (The Name of the Wind, by Patrick Rothfuss – Book One in the Kingkiller Chronicles): Although Kvothe was the star of two books I read this past year, I am nominating only his performance in The Name of the Wind as it was his most likeable. In this book we are told (by him) about how his seemingly exceptional skills, determination, and wit enabled him to rise from an orphan living in poverty to a gifted aspiring arcanist. Roaden (Elantris, by Brandon Sanderson): The Prince of Arelon, Roaden is an idealistic, charismatic young man who pushes his father to implement economic and social reforms their kingdom desperately needs. On the eve of his wedding, however, he is afflicted by a disease called the Shaod and exiled with others like him to the city of Elantris. On the verge of giving up, he instead finds a new purpose in organizing his fellow outcasts. Winner: I went back and forth on all of these characters, but ultimately my decision is Roaden. I found him very likeable and thought his selfless desire to constantly work for the betterment of others helped push him past the often arrogant Kvothe. Adda Karpe (Barbary Station, by R.E. Stearns): Adda was truly a joy to meet. An extremely talented programmer/hacker and aspiring space pirate, she was also an extreme introvert (like myself!) who finds the energy and motivation to get through the day by cuddling her girlfriend and harvesting the hallucinogenic mushrooms she uses to help focus on work. Lisette Toutournier (Everfair, by Nisi Shawl): A free-spirited French woman who rises to a highly influential position in the fictional African nation of Everfair. In addition to her diplomatic skills, her keen intellect and life-long fascination with machines put her right at home in her new surroundings. Through the course of the book, her duties and obligations push her to confront both her identity as a woman of mixed race and the dynamics of her decades spanning relationship with the ex-wife of her former lover. Sarene (Elantris, by Brandon Sanderson): After learning of her husband-to-be’s suspicious death upon arriving in a foreign land, this cunning, sharp-tongued princess wasted little time establishing herself in her new home. Between inserting herself in local politics, training the previously idle court ladies in fighting techniques, and providing humanitarian aid to the outcast people of Elantris, she becomes a force for good in an otherwise stagnant kingdom. Shallan Davar (Oathbringer, by Brandon Sanderson – Book Three in the Stormlight Archive): Shallan overcame a lot in this story; she came to grips with her multiple personalities, confronted her past family traumas, resolved a love triangle (further complicated by the aforementioned multiple personalities), and stepped into her powers as a Radiant. She also played a pivotal role in some very key situations, cementing her position as a key player in the fight against Odium. Winner: I honestly could (and even did) make a case for each of these women and indeed went back and forth on my final decision multiple times. Upon my final review, however, I found Lisette to be the best choice. She was a deep, multifaceted character whose story exposed me to a fresh perspective that really made me think. Bast (The Wise Man’s Fear, by Patrick Rothfuss – Book Two in the Kingkiller Chronicles): Companion to an older Kvothe in his guise as an innkeeper, Bast is certainly more than meets the eye. Not only is he a fae/demon of some kind, but underneath his often laid-back and jovial exterior lies a ruthless desire to see his tutor restored to his former glory. Da Shi (The Three Body Problem, by Liu Cixin – Book One of Remembrance of Earth’s Past Trilogy): I’m pretty sure you’re not sure you’re supposed to like him, but this detective had a certain vulgar charm and ruthless cunning that made him stand out for me. Kiin (Elantris, by Brandon Sanderson): Sarene’s uncle and political exile, Kiin was a kindly family man, excellent cook, and former pirate who provided his niece with some much-needed support in her new home. Winner: This one goes to Bast. He was just such an interesting character and I feel like we’ve only scratched the surface of what is going on with him. I can’t wait to learn more of his backstory and see what inspires his a actions. Assuming, of course, that this series ever gets finished. Devi (The Wise Man’s Fear, by Patrick Rothfuss – Book Two in the Kingkiller Chronicles): An underground money-lender who despite her pixie-like appearance and flirtatious nature has by all accounts earned her nickname “Demon Devi.” She also turns out to be an extremely gifted alchemist and sympathist who enjoys collecting favors from interesting people. Lift (Oathbringer, by Brandon Sanderson – Book Three in the Stormlight Archive): Lift used her “awesomeness” to steal more than a few scenes in this book, most notably by crashing the private visions of a minor deity and later on by playing a key role in foiling the plans of a considerably larger one. She also managed to keep her irreverent, and hungry, outlook on the world despite having matured a bit since her previous appearance. Sam (The Last Days of New Paris, by China Mieville): A mysterious photographer/secret agent who joins forces with the main character Thibaut to navigate the Nazi and demon infested streets of Paris. Her true intentions, however, remain something of a mystery. Winner: As much as I gave some serious last-minute consideration to Devi, it felt wrong to not choose Lift. She’s such a fun character to have around in any situation. She’s also the nominee I’d most want to hang out with; maybe hit up an all you can eat buffet to chat about life, the universe, and everything before she runs off. Exquisite Corpse (The Last Days of New Paris, by China Mieville): The physical manifestation of a surrealist art exercise, it didn’t speak at all but its presence certainly loomed large throughout the story. It’s fascination with, and protectiveness of, Thibaut brought an added curiosity to an already weird tale. Wyndle (Edgedancer, by Brandon Sanderson – Book 2.5 in the Stormlight Archive): Lift’s vine-like spren companion and proud owner of a chair garden in the Cognitive Realm. For as impulsive and capricious as his partner may be, Wyndle is equally level-headed and logical. Often a voice of sense and reason, his kindly advice and dry humor brings a balance to the duo that makes them quite a team. Whatsitsname (Frankenstein in Baghdad, by Ahmed Saadawi): A corpse sewn together from human remains collected at bomb scenes throughout downtown Baghdad, the Whatitsname came to life when entered by the soul of a slain security guard. Initially seeking revenge for each of its parts, it ultimately comes to question the righteousness of its quest. Winner: The tough part about this category was that not was each character so different, but the stories they came from were all very different as well. After some deliberation, the winner here is Whatsitsname, on account of the questions it raised about the roles of justice, vengeance, and order in a society racked by violence. Ancillary Justice, by Ann Leckie (Book One of the Imperial Radch Trilogy): Simplified greatly, this was the story of a once-sprawling troop ship AI now confined to a single, human body through a complicated series of political maneuverings and betrayals. Seeking revenge for its lost lives, our main character pins her hopes on locating a lost relic from a conquered civilization. Persepolis Rising, by James S.A. Corey (Book Seven of the Expanse Series): While the old powers in the Solar System have been slowly rebuilding their strength following the cataclysmic events of the previous novel, new forces emerge from beyond the ring gates seeking to expand their reach. The Three Body Problem, by Liu Cixin (Book One of Remembrance of Earth’s Past Trilogy): The story of a modern-day Chinese research scientist who stumbles upon a Cultural Revolution-era conspiracy involving contact with alien life. Winner: This really came down to Ancillary Justice and The Three Body Problem, and I really had to think hard about which story I liked more. I put myself in a tough position on this one, so I am going with my gut answer and deciding upon Ancillary Justice. As much as a I loved the harder sci-fi angle of the Three Body Problem, I got into the story of Ancillary Justice in a way that made it very hard to pick against. Moving on before I change my mind. Name of the Wind, by Patrick Rothfuss (Book One of the Kingkiller Chronicles): This story began the journey of the prodigy Kvothe. After escaping from a group of demons that murdered his parents and traveling companions as a child, Kvothe overcame being a penniless orphan to enlist in a prestigious University to study the magical arts. Along the way, he makes a rather impressive and memorable list of friends and foes. Elantris, by Brandon Sanderson: Once a beacon of progress, the city of Elantris has fallen into ruin after magic system supporting it has faltered. In its shadow, the Kingdom of Arelon is desperately seeking to secure its borders against the rapidly expanding Fjorden Empire. Winner: There is now way I can’t pick Oathbringer. I don’t know if that’s entirely fair given where it occurs in its series, but my expectations for this going in were sky-high and the book more than delivered. It was a very long book, but still felt packed full of action, world building, and character development that culminated in one epic battle. Radio Free Boston – The Rise and Fall of WBCN, by Carter Allen: A behind-the-scenes look at Boston’s WBCN radio station from its founding in 1968 to its eventual demise in 2009, told by the people who worked there. Barrel Aged Stout and Selling Out: Goose Island, Anheuser-Busch, and How Craft Beer Became Big Business, by Josh Noel: The story of how Chicago’s Goose Island Brewing Company rose to become one of the early champions of “craft beer” in the United States and how its sale to the multinational conglomerate known as AB-Inbev changed the American beer industry. Summer of ‘68, by Tim Wendell: An examination of the 1968 baseball season and how the World Series matchup between the Detroit Tigers and St. Louis Cardinals reflected the social unrest going on at the time. Winner: I’m going for the nostalgic pick here and selecting Radio Free Boston. It was a fun and informative look at my favorite radio station growing up. Well, that rounds out my 2018 awards. It was a great year for reading and I look forward to seeing what 2019 has in store. See you all in the new year! With Halloween right around the corner, I went searching for ideas on how to mix up my anticipatory posts. That quest led me to this fun tag, which I found on another blogger’s page (thank you Madame Writer). This is a long one, but it sure did get me ready for tomorrow night! It’s really hard to pick just one, so why don’t I refer you to the Halloween music post I did yesterday? Gut answer is probably Black No. 1 by Type O Negative, but I reserve the right to change my mind a few times. I suppose any number of things would fit here. I’d hate to run into a murder-hobo or something like that in either location, nor would I especially like to come across a bear while hiking. Nope. If taken as a game, it’s always seemed pointless to me. If taken as something more intense/serious than that, WHY DO THAT!? I’m going to confess now that I’m not all that into horror so picking a favorite is hard. I was really into monster movies as a kid, though, so does Godzilla qualify? If not maybe I’ll pick the Shrike from the Hyperion novels. I’ve seen some weird/crazy stuff in my younger days, though most if not all of the truly creepy or weird can be attributed to my, er, state of mind at the time. Setting those experiences aside, in everyday life I really have only had more run-of-the-mill random house noises or centipede in the basement type things happen. No, I’d probably psych myself out about it. That said, I have spent the night in a few hotels that are supposed to be haunted (though I have no ghost stories to report). Yes, but more in the idiosyncratic sort of way. Maintaining certain rituals during sports games, not mentioning certain things or events I want to happen, things of that nature. Nothing more menacing than the usual tricks of the eye. I also wear glasses, so that may have an impact as well. Thrillers. I’m generally not a fan of gore and that is probably the number one reason I never got into the horror genre. Yes. I don’t necessarily think that we can interact with them without extraordinary cosmic upheaval or technology WAY beyond or current capabilities, but I do believe they exist. Sure, if you count mixed drinks. Yeah, probably. I’m not necessarily proud to admit this but that’s my honest answer. Nope. Seemed pointless to me as a kid and I’m not about to start doing it as an adult. No, though I suppose I could also be called somewhat agnostic on the issue. I’m not exactly sold on the idea of their counterparts either, at least in any mainstream sort of way. Assume it’s from next door or outside most likely. I’d probably be more weirded out in a strange setting, like an Airbnb though. This doesn’t really sound like my idea of a good time, but I wouldn’t mind hanging out with Bill Murray in Zombieland I guess. My Flava-Flav inspired steampunk suit. Basically I wear black dress pants and shirt, a knee-length men’s black dress jacket, a top-hat with gears on it, big silver goggles, and a bronze wind-up clock around my neck on a thick chain. Usually a cane completes the ensemble. Absolutely. There are some very nice cemeteries in my area and I find evening strolls in them very relaxing. Practical answer is probably a machete since it doesn’t rely on expendable ammunition and can serve other uses. 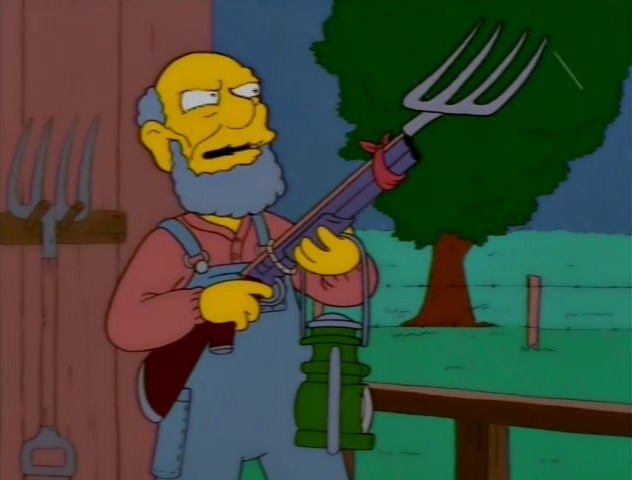 My purely fictional, and likely impractical, answer is shotgun with a pitchfork bayonet. My likely answer is party, but that might change after taking my son out for his first trick-or-treat this year (at least until he gets too old to want his parents around). Well, for starters I’m a guy but in keeping with the spirit of the question I’d probably be the skeptic. I give myself even odds of living. Not necessarily, but a little decompressing by doing something mindless isn’t out of the question. 24. Whilst watching scary movies, are you the type who yells at the characters, the person with their eyes covered the whole time, or the person who falls asleep? Who says I can’t be all of the above? It’s a pretty even mix in my house. I’ve gotten my wife pretty good over the years, but she never fails to return the favor. Our two-year old seems to be trying to get in on the action, a prospect that is both adorable and concerning. Uh-oh. Um, I don’t really read scary books! I’ve already mentioned Hyperion in this post which has some scary/horror elements to it, but I don’t know if it quite fits what this prompt was going for. I also enjoyed the Lovecraft collection I read earlier this month, though I can’t really say that it scared me. Grade school probably. I recall for sure seeing Ernest Scared Stupid in the theater at roughly 9 years old so I’ll go with that. Truly a horror classic. I don’t know for sure, but the first one I remember is a light blue felt stegosaurus suit. I loved that thing! My official costume is Vampire. My son has been really excited for over a month about being a vampire for Halloween, so that is what the whole family is doing. How/if he knew what a vampire was at the time he asked for this is a mystery. My unofficial costume that I’ll wear to work or more minor Halloween outings is MegaMan from the series of NES games. It’s nothing crazy, just a hoodie designed to look like him and a stuffy of his robot dog, Rush, pinned to my shoulder. Black cat all the way! I actually had one as a teenager named Edgar (after Edgar Allen Poe) and we had a special bond, probably due to our mutual love of food and extreme introversion. I’d love to have a cat now as an adult, but my wife and I are now both terribly allergic. It’s been awhile since I last took on a book tag and this was definitely one of the more intriguing options I had lying around in my notes. I like to think that I am fairly inclusive and open-minded in my readings, so, to the extent possible, I am limiting my selections to books I’ve reviewed here. I had to think about this one for a bit, but I eventually decided that I am going with Colleen McCollough on this one. I absolutely love her Masters of Rome series and consider it the absolute standard against which I will forever judge all works of historical fiction. I know she has written other things that are bit different from these books (and with which I am entirely unfamiliar), but it was hard to pick against her after so thoroughly enjoying seven books and nearly 6,500 pages of her work. Ugh, another favorite question! I’m calling this one a toss-up because I couldn’t decide. It’s either Darwi Odrade from Heretics of Dune and Chapterhouse: Dune or Vin from the first era Mistborn trilogy. After spending a pretty good amount of time thinking about this what would make a novel feminist, I decided upon Everfair, by Nisi Shawl. I did so because it features two prominent female characters who challenge conventions with their political activism, academic/scientific interests, and sexuality. A quick read of the author’s bio reveals that these are all topics near and dear to her own heart, as her academic and literary focus is on Sci-Fi and Fantasy works that look at, among other things, issues of race, gender, sexual orientation, and socio-economic status. 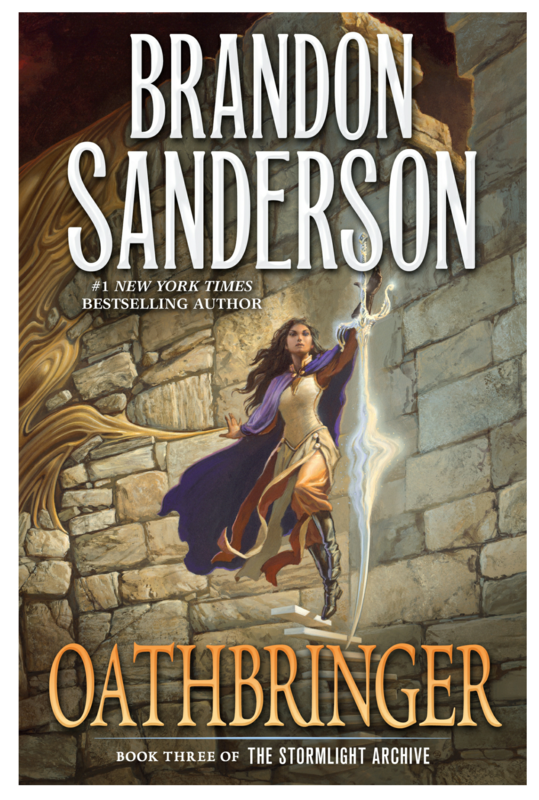 Not sure that cover art is necessarily a sign of feminism, but Brandon Sanderson’s Oathbringer, one of my favorite books from this year, has a rather striking depiction of Jasnah Kholin on the cover. While I certainly wouldn’t call them “girls,” I’ll pick the all-woman cast of The Stars are Legion, by Kameron Hurley – a female author who strongly identifies as a feminist. Digging a bit deeper here, I read an interesting review after finishing this book that touched upon the issue of gender in this universe where men simply do not exist even as a concept (at least in the scope of the story thus far). It just so happens that I’ve read two books so far this year starring main characters that fall within this category. The first was Barbary Station, by R.E. Stearns, in which engineer/programmer Adda Karpe and her girlfriend Iridian try to join a band of space pirates. The second book was the aforementioned Everfair, in which a young biracial French woman named Lisette enters into a polyamorous relationship with an Englishman only to find a more lasting love with his (former) wife Daisy. Different is a bit ambiguous here, but easily the most atypical female POV I can readily recall is Purga from Stephen Baxter’s Evolution. She is a small mammal living roughly 65 million years ago in the late Jurassic era. I’ll go with Soon I Will be Invincible, by Austin Grossman for this one though I won’t spoil which of the novel’s superheroines ultimately saves the day. All the books in the The Expanse series featuring Bobbie Draper. It’s no contest between her and James Holden, or any of the other Rocinante crew members for that matter. Needless to say, certain events that happen early on in Persepolis Rising made me very happy. I’m going to assume this meant to say female main character. Um, lots? Sarene from Brandon Sanderson’s Elantris is one of my favorite new (to me) characters of the year thus far and she would probably embrace being called a feminist to boot. Here we go with another fun book tag I unearthed. Who doesn’t want to assemble characters from their favorite books into a zombie apocalypse survival group? Let’s see who I wind up with. Uh-oh, not a redshirt in the bunch. This might get painful. On paper, though, I couldn’t have asked for a much better crew. James Holden (Persepolis Rising). Eh, maybe this isn’t such a bad thing. Holden has a tendency to draw a lot of attention to himself that greatly complicates life for those in his wake. I could see him getting the group killed or worse in the zombie apocalypse. Naomi Nagata (Persepolis Rising). I feel bad about this one, but let me try to rationalize. Naomi’s expertise is in advanced computing and engineering which probably won’t be needed in the zombie apocalypse. More importantly, her physical inability to handle Earth’s gravity after a lifetime in space would make her a huge liability. Kelsier (Mistborn: The Final Empire). I’d like to think that it was a situation where it was either him or me, or perhaps karmic retribution for Naomi, but I can kind of see this one. Especially if I hadn’t proven my usefulness to the group at that point. Vin (Mistborn: The Final Empire). Ouch. That’s a significant blow to our survival chances right there. Not only do we lose her formidable fighting and scouting abilities, but we also lose her experience as a scavenger and thief. This one hurts folks, but I’m sure she went out a hero. Darwi Odrade (Heretics of Dune). If she is the idiot, the rest of the team must be exceptionally intelligent. The only way I believe this is if you factor in melange withdrawal. Alma Mavis Taraza (Heretics of Dune). Seems highly likely. Taraza has a formidable intelligence along with superior skills in leadership, tactics, and leveraging social and political influences. Melange withdrawal is again a concern though. Bilbo Baggins (The Return of the King). We might be in trouble here unless old Bilbo has some tricks up his sleeve. I hope pipe weed and ale have medicinal powers way beyond what I am aware of. Frodo Baggins (The Return of the King). Frodo is one brave and resourceful Hobbit, but he wasn’t exactly a fighter. Fortunately this is a pretty veteran group that doesn’t need much advice on weaponry. Severus Snape (Harry Potter and the Prisoner of Azkaban). Yeah, I can get behind this choice. Especially with Vin out of commission and Kelsier busy tripping me. No chance he beats either Odrade or Taraza in a duel, but there’s no doubt he’s suited to this role. Hermione Granger (Harry Potter and the Prisoner of Azkaban). Feeling pretty confident with Hermione as team leader. I can only imagine how badass she’d turn out with both Odrade and Taraza around to guide her. Keeping things going with another fun book tag I came across while looking for things to write about. This one gives you a peek at some of the inner workings of how things get done here over here at BeerRantsandBooks. I don’t really like playing the tagging game, so I again offer my apologies if not doing so is some sort of no-no around here. No disrespect is intended to the tag’s creators. Wherever I can. Usually that means my couch or dining room table, though I often write in bed, at work during lunch, and on the subway as well. I’m currently sitting on my back deck and writing which is a trend I’d like to continue in the coming months. Depends on the book, how much I want to say, and how busy I am with work and childcare. Anywhere from a few days to a few weeks though I’ve had some linger on for longer. I started my blog back in November 2014, though it wasn’t until December 8th of that year that I got my first book review up. Accepting my limitations as a writer/reviewer. Despite being an otherwise fairly intelligent and capable individual, writing, even informally, has always been a bit of a process for me. I often have difficulty pulling all the ideas out of my head and then getting them organized on a page. I like to think that I’ve improved over the years of plugging away here, but I’m still not as efficient at it as I would like to be. Going back to the previous question, I like having a book blog because it pushes me to write more. This has on occasion been a source of frustration, but in the end I find it worthwhile as it gives me a creative outlet through which to voice my thoughts while at the same time encouraging me to constantly seek out new reading material. Lately I’ve been having a lot of fun searching out and writing book tags as it gives my blog more a personal touch that it hasn’t really had until recently. Beyond that, I’ve really enjoyed my beer reviews that include mini photo shoots. Anytime I’m able to combine a beverage with some kind of prop (usually an on-theme book or Star Wars Lego) I’m having fun. My most rewarding post, however, is one I wrote back in November 2015 about going through my old baseball cards. Not only did looking at them bring back a ton of childhood memories, but the post ended up getting linked to on Major League Baseball’s Around the Horn blog. That is without a doubt my proudest moment as a blogger and it always makes me happy when I see it get hits. I’m not sure I really have a favorite since what I’m into posting so often depends more on my mood and what subject matter I have to work with. Usually either in the morning on my subway ride into work or in the evening after I have gotten my son to bed. Time has been at a premium for me lately so I try to get my writing in whenever and wherever I can. For the most part. There have been a few I’ve skipped for a variety of reasons, but on the whole I am very selective when picking up books and enjoy writing about my thoughts on them. This may sound crazy, but here goes. I typically type up a draft on my phone whenever and wherever I can; on the subway, in bed, sitting on the couch, etc. I then print that to (*gasp*) paper and make revisions in any and all of the locations listed previously. I do final draft either on my laptop or sitting at desk. Thank you wireless printer and Google docs! I usually start drafting my reviews within a day of finishing the book, but depending upon my schedule it can sometimes take a few weeks for me to finish. I do always like to at least get my thoughts outlined while the book is still fresh in my head. I generally post 2-3 times per week. Lately I started alternating weeks were I post Monday/ Wednesday/Friday and those where I post Tuesday/Thursday and I like how that has been going. I’m jealous of the people I see with dedicated posting schedules and thematic days, but I know that I would never be able to keep up with that and just end up getting overwhelmed or stressed in try to. I’ve decided to try out another book tag for today. Since I’ve having fun with these lately, look for them to become a new feature here. I’m not really into tagging, so I’m just searching and grabbing the ones I like most. Apologies if this is some kind of major WordPress faux pas or breach of etiquette. I find the majority of my new books/authors by either skimming through library listings, the Tor Publishing newsletter, or the ARC piles featured over at Whatever. How has your taste in books changed since you got older? I’d like to think my taste has gotten more refined over the years. I also used to read a lot of political non-fiction as a teenager and I haven’t really been as into that since university. Rarely. I probably only buy 2-3 a year, if that. I am fortunate enough to live in an area with an excellent library network, giving my library card quite the workout. A few years back I was looking for a hobby or some kind of creative outlet and after brainstorming ideas (and realizing I didn’t have sufficient time or space for home brewing), I decided upon a blog. Blogging had the added benefit of forcing me to write more frequently, something that doesn’t always come easy to me. I initially had some trouble deciding on a theme, but here I am nearly three and a half years later still posting about beer and books. Not sure I really fit into either the beer blogger or the book blogger world, but I’m having fun doing my thing which was exactly the point. Usually just feel a bit disappointed. I suppose I have on occasion taken my frustrations to the internet, but what else can you do? How often do you sneak peek at the ending to see if there is a happy ending? Never! Is this a thing?!?! I’ve seen this tag making the rounds lately and thought it would be fun to play along. Hopefully I’m not too late to the party. Generally speaking I feel like if you’re going beyond a trilogy, there should be both a compelling reason to do so and a plan for where the series is going. There are a few longer running series that I love, but what they all have in common is that they clearly have a destination in mind. They’re fine so long as the author intends to keep the series going in a timely manner. The last few years I’ve been doing almost all my reading via Kindle and switching between the actual device and the app on my phone. I really love the portability and convenience of being able to borrow ebooks from my local library. What kind of sick tag asks a reader to make a choice like this? There are so many books I like for so many different reasons that I’m not sure I could choose. Gun to my head answer: Children of Dune. Don’t ask how often I changed that before hitting publish. Another tough choice. I tend not to remember the bad ones, but I do recall particularly disliking Ethan Frome and Tuesdays with Morrie. Both of these I had to read for school, though. The former was forced upon me as a seventh grader and the latter upon entering university so I do take that into account. With the exception of Upton Sinclair’s The Jungle I think I’ve disliked nearly every book I’ve had to read. This is some kind of unwritten rule, right? If they fit the story, fine I guess. The trope doesn’t really do anything for me either way. Just don’t add it for the sole purpose of selling the book. I’m pretty selective, so this doesn’t happen often. My last DNF was First and Last Men, by Olaf Stapledon but that was a few years ago. It was a very dense hard sci-fi novel written in the early 1930s that I just couldn’t get into. Ernest Cline’s Armada recently came very, very close. Currently reading Elantris, by Brandon Sanderson. I’m absolutely hooked on his Cosmere universe, so I’ll be reading a lot from him. Frankenstein in Baghdad, by Ahmed Saadawi. Consider it recommended again. Depends on how we’re treating translations. It’s Homer’s Odyssey if we’re going with the date of the original and probably Dune (1965) if not. Again, it depends on how we’re dealing with translations. It’s either Frankenstein in Baghdad (English language translation published January, 2018) or Collapsing Empire, by John Scalzi (March, 2017). Gut answer: Haruki Murakami. Moving on before I change it. Borrow. My library card gets a real workout, especially since I can use it for ebooks. American Gods, by Neil Gaimon. So many people whose opinions I value spoke highly of this, but I just never really got into it. Perhaps it was a victim of hype. I’ve been known to do both, as place savers and as a means to keep track of passages I particularly like. Depends on the book and what I happen to have handy to use as a bookmark. Some of the most well loved books in my library have extensive dog-earing while others have multiple bookmarks. A BOOK YOU CAN ALWAYS REREAD? There are a few books I reread with some regularity, most notably Frank Herbert’s Dune series and Hunter S. Thompson’s Fear and Loathing on the Campaign Trail ‘72, but those depend highly upon my mood. For an anytime reread I would have to pick The Hitchhiker’s Guide to the Galaxy. I do a lot of reading on the subway so I’m pretty good at phasing out background noise, but I don’t think I could purposefully listen to music and be able to focus on reading. Really depends on the book and the author. Both are fine in the proper context. Multiple days. I no longer have the luxury of sufficient time to finish a book in one day. ONE BOOK YOU READ BECAUSE OF THE COVER. Hyperion, by Dan Simmons and it turned out to be one of my favorites. The image of the sunset gleaming off the Shrike as it stares out across an alien landscape captivated me for years before I even read the book.